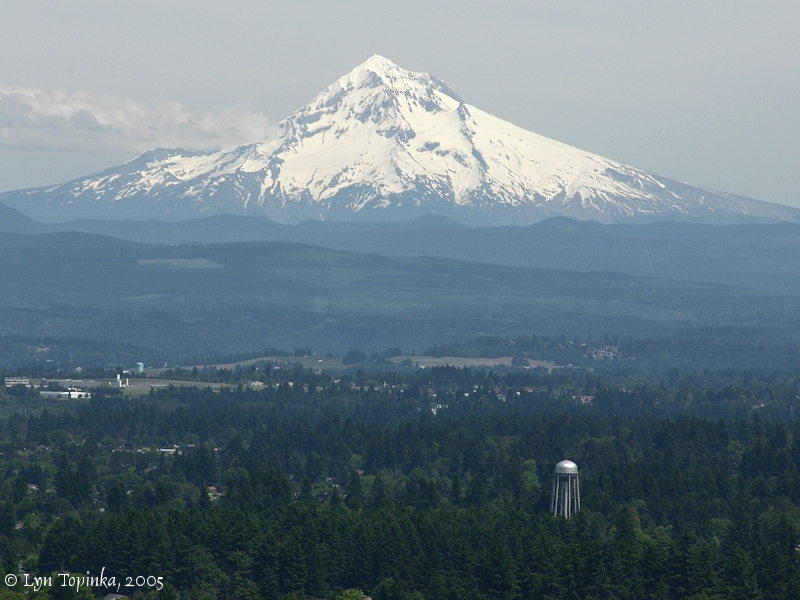 Rocky Butte is a volcanic cone of the Boring Lava Field. 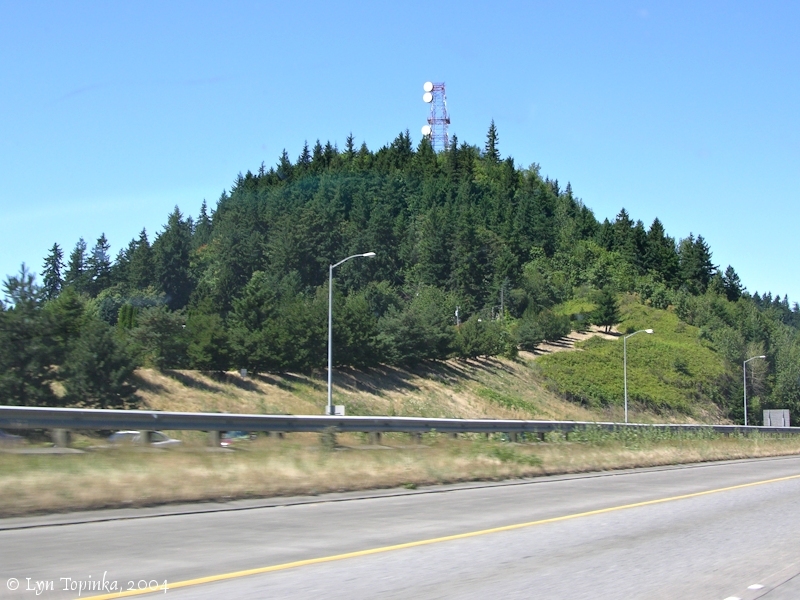 Once known as "Wiberg Butte", today it is called "Rocky Butte" after the quarry on the east side. 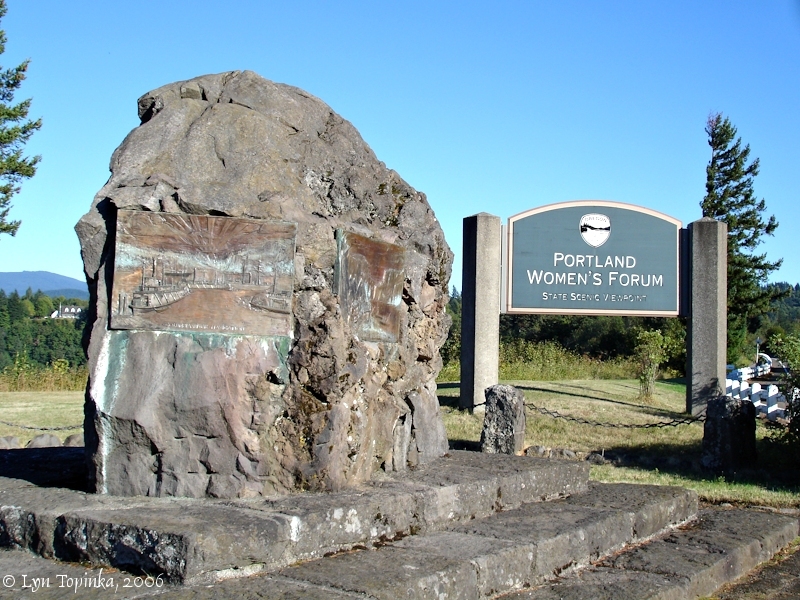 Rock from the quarry was used for the Penitentiary at Walla Walla, the Portland Hotel, and the Old Steel Bridge in Portland, and as a source rock for the culverts of the Union Pacific Railway. 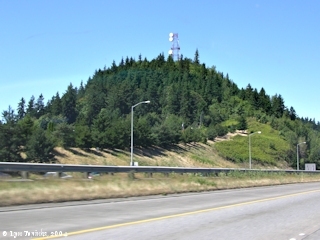 The slightly-over-600-feet-high butte is about 1.3 million years old, with two vents at the top. 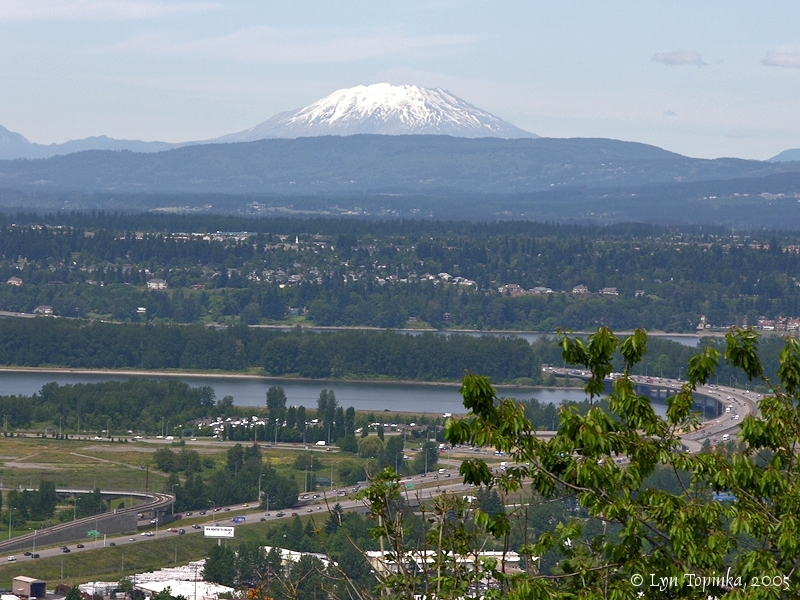 Rocky Butte is the eroded intrusive core of a late Pleistocene basaltic andesite center. 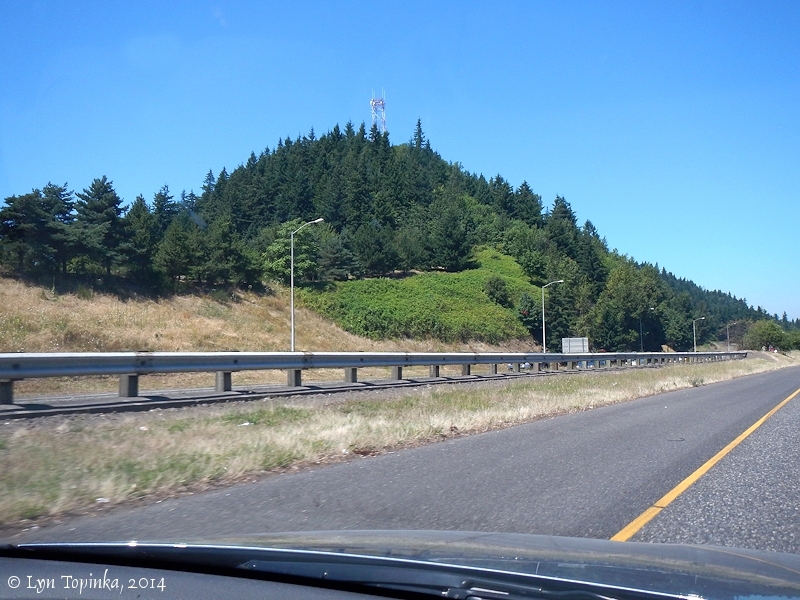 It is one of the nearly 80 vents and cones of the Boring Lava Field which surrounds Portland, Oregon. The field is 1 to 2 million years old. 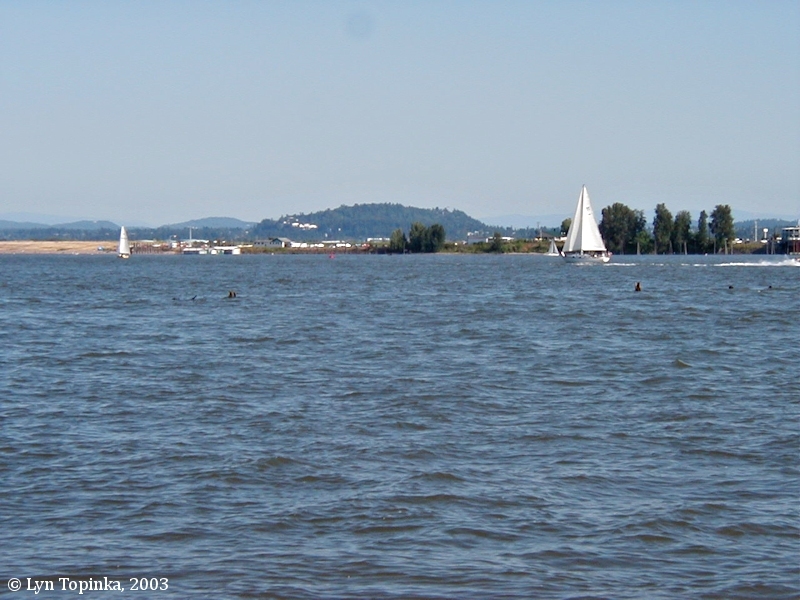 As Lewis and Clark paddled down the Columbia River on the west side of the Columbia River Gorge, they passed many cones of the Boring Lava Field, including the big shield volcano of Larch Mountain to smaller cone of Rocky Butte. 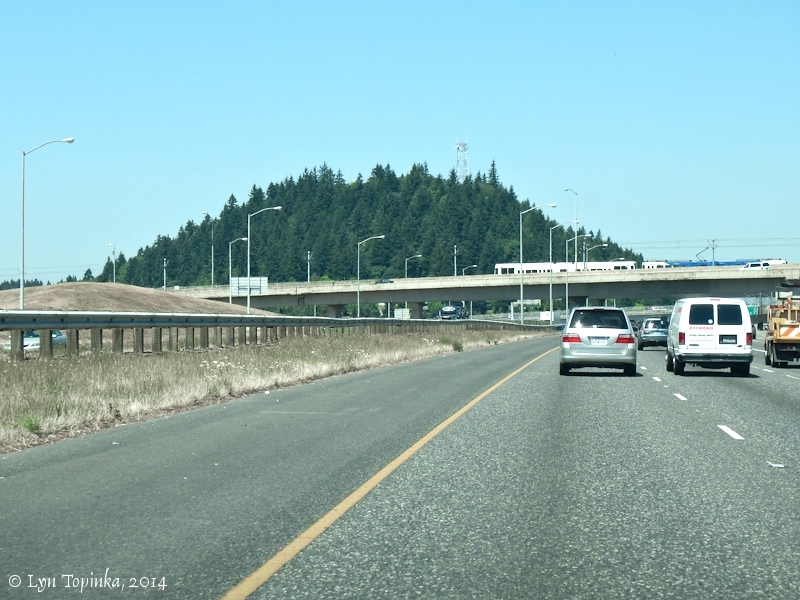 Click image to enlarge Rocky Butte, Oregon, and Interstate 205. 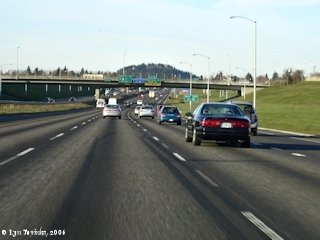 View from Interstate 205 heading north. Image taken February 19, 2006. In 1859 Rocky Butte was settled by Charles G. Schramm. 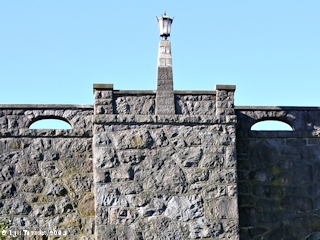 In 1879 it was deeded by the United States Government and in 1882 Rocky Butte was acquired by Henry Villard and the Oregon Railroad & Navigation Company as a source of rock for culverts for the Union Pacific Railway. 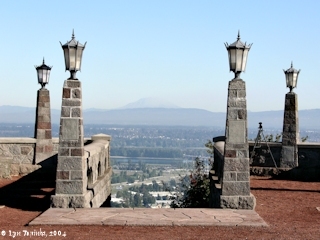 With the coming of cement for building material, the Rocky Butte's value declined, and in 1923 the Butte was purchased by Joseph A. Hill, as a future site for the Hill Military Academy which was in need of expansion. In 1931 the Academy moved to the north end of the Rocky Butte. 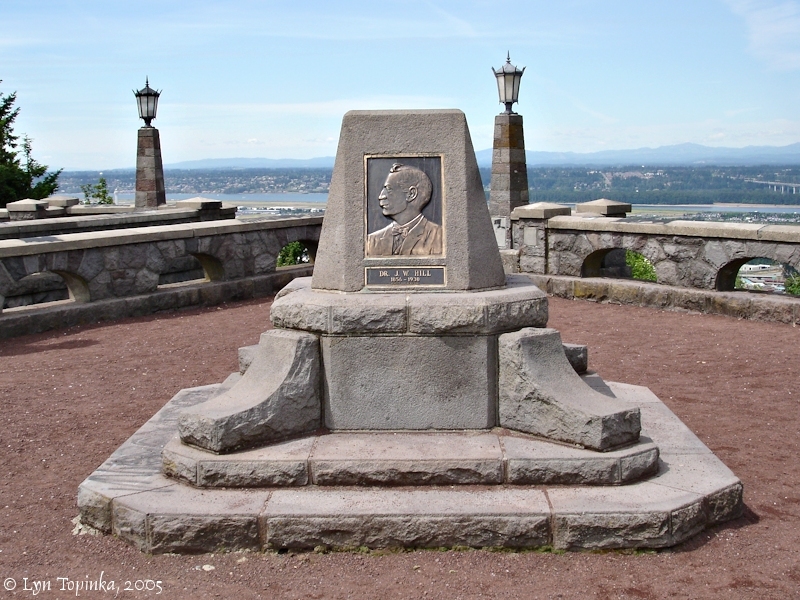 In 1935 the crest of Rocky Butte was given to Multnomah County by Joseph A. and B.W. Hill. "Joseph Wood Hill Park" was created at the summit and dedicated to the public in memory of their father, Dr. J.W. Hill, an early Oregon educator and for many years head of the Bishop Scott Academy, which eventually became the Hill Military Academy. The park was improved during 1937-39 as a Work Project Authority (WPA) project, with stone walls, roadways, and a wide parking platform. 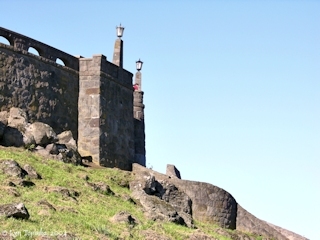 The rock used for abutments and walls came from the Rocky Butte Quarry. In 1938 a road down the other side of the butte was built, which, because of the steep grade, included a turn within the tunnel. This proved so successful that many other tunnels throughout the state were patterned after it. 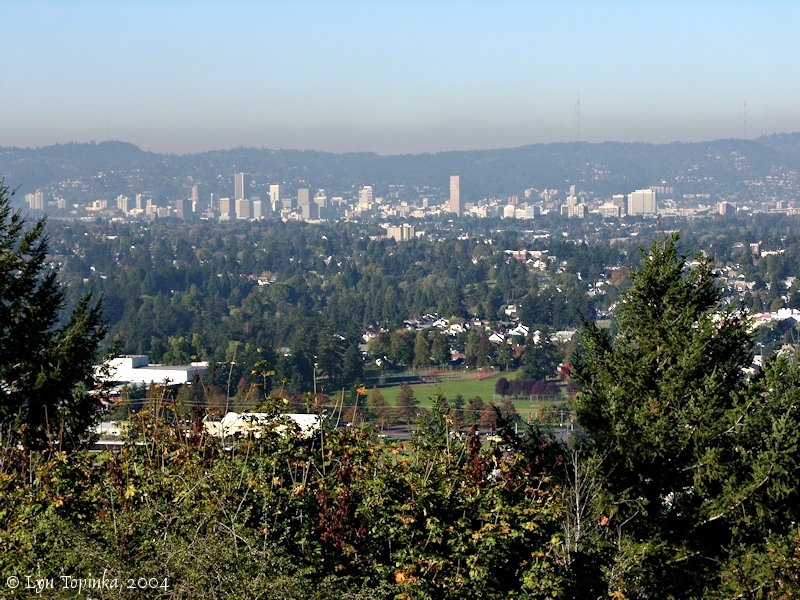 In 1988 the City of Portland acquired 16.82 acres on top of the butte and designated it as the "Rocky Butte Natural Area". Included in this is the 2.38 acre "Joseph Wood Hill Park". 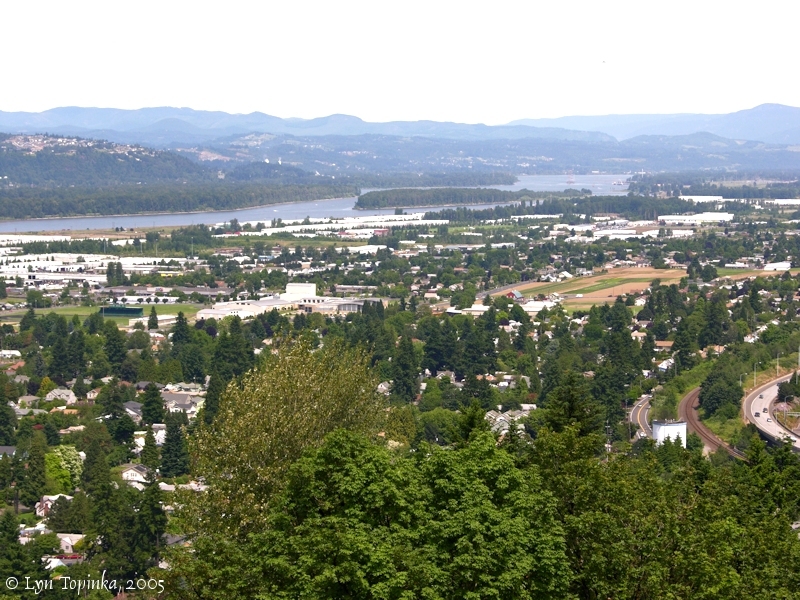 In 1991 Rocky Butte Road and parts of NE Fremont Street and 92nd Avenue were added to the National Register of Historic Places as the "Rocky Butte Scenic Drive Historic District" (District #91001550), encompassing 215 acres, 10 structures, and 3 objects. "... An aircraft beacon and observation platform at the end of the winding road leading from NE. Fremont St. marks the summit of ROCKY BUTTE (612 alt. ), one of three cinder cones of volcanic origin on the east side of the city. Its slopes are rough and broken. A grove of quaking aspen, not ordinarily native to the lower altitudes of western Oregon, grows on the northern side. 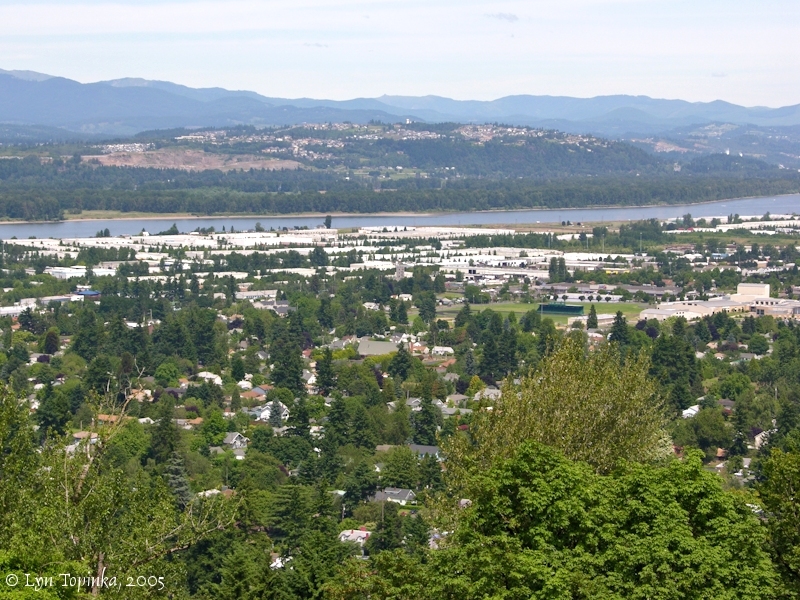 From Rocky Butte there is a view of the city stretching to the hills beyond the Willamette and northwestward to the lowlands of the Columbia River, In the angle between the rivers are North Portland's large meat packing plants and stockyards. Beyond the Columbia are the peaks of St. Helens, Rainier, and Adams. Eastward the Columbia is lost between encroaching foothills of the Cascades, while slightly to the southeast rises Mount Hood ..."
The Joseph Wood Hill Park at Rocky Butte's summit was constructed by the Works Progress Administration (WPA) in the 1930s. 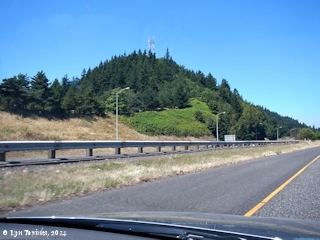 According to Russ Evarts and others (2009), "the summit park is probably within the throat of the vent [Rocky Butte, a Boring Lava cone] ..."
Click image to enlarge Dr. J.W. 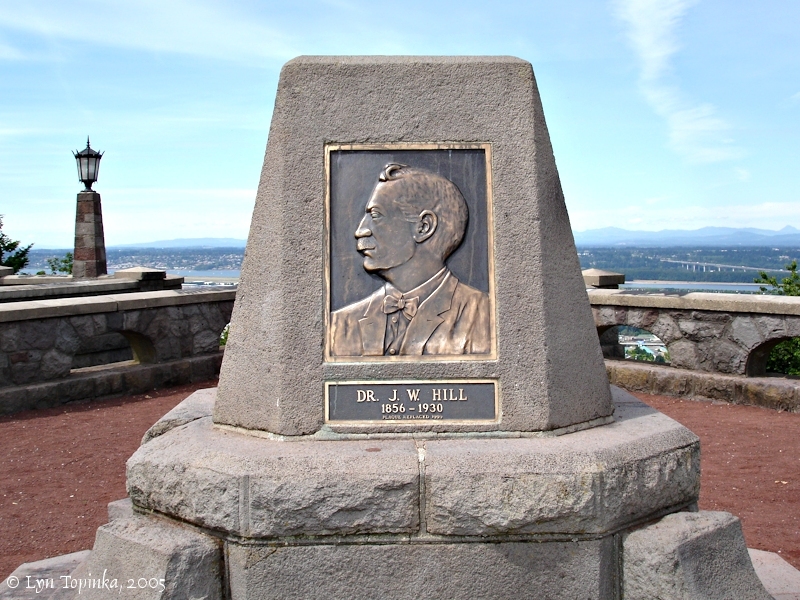 Hill monument, Rocky Butte, Oregon. Image taken June 15, 2005. Stone from the Rocky Butte Quarry was used up and down the Gorge in the culverts of the Union Pacific Railroad. 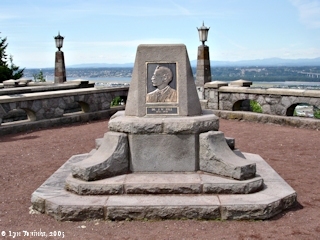 In the 1930s a 50-ton basalt boulder was used as at the Portland Women's Forum Scenic Viewpoint as a dediction to entrepeneur Samuel Hill, an early promotor of the Historic Columbia River Highway. STONE FOR WEINHARD BUILDINGS. -- Stone for the foundation walls of H. Weinhard's building at Fourth and Alder, is being delivered from the Butte quarry, some seven miles east of the city. It was from this quarry that the stone for H.C. Leonard's building at First and Ash streets was received. It looks like sandstone, and is said to be a sort of basalt, very hard and rather difficult to quarry. Dimension stone can be broken off in large blocks of the ordinary black basalt so common in this section, by a blow from a sledge, but the Butte quarry basalt has to be drilled and "feathered" in order to break it up." Source: Morning Oregonian, May 7, 1902, courtesy Historic Oregon Newspaper Archives, University of Oregon Libraries, 2016. Click image to enlarge Sign, Portland Women's Forum Scenic Viewpoint. This large 50-ton basalt boulder was quarried at Rocky Butte. Image taken September 23, 2006. Click image to enlarge Stonework, Rocky Butte, Oregon. An ashy Mount St. Helens, Washington, is in the distance. Image taken October 14, 2004. 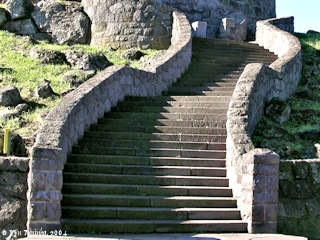 Click image to enlarge Stonework, Rocky Butte, Oregon. Image taken October 14, 2004. 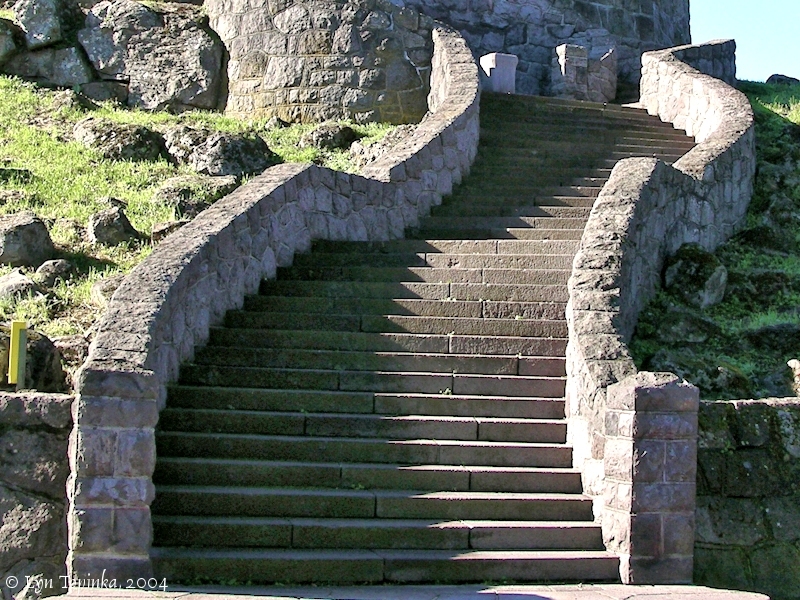 Click image to enlarge Stairs, Rocky Butte, Oregon. Image taken October 14, 2004. The top of Rocky Butte presents a fantastic views of Lewis and Clark's "Columbian Valley", including the Interstate 205 Bridge, Government Island, the Portland International Airport, and the entire Vancouver/Portland reach of the Columbia River. The skyline of Portland, Oregon is visible to the west, and Camas and Washougal, Washington are visible to the east. 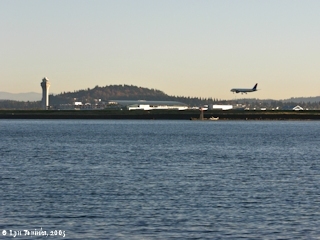 Another Boring Lava cone, Prune Hill, rises along the Washington shore in the northeast. 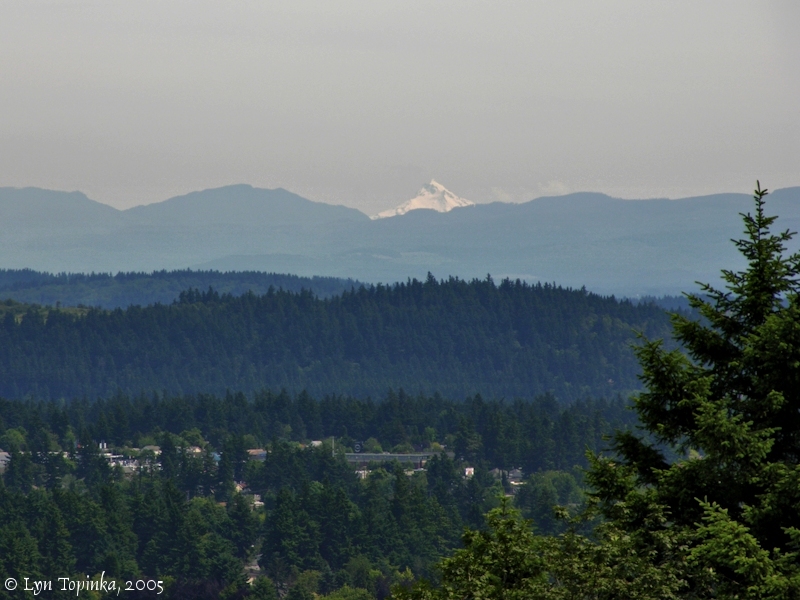 The peaks of the Cascade Range are nicely visible from Rocky Butte. The volcanoes Mount Rainier, Mount St. Helens, Mount Adams, Mount Hood, and Mount Jefferson are nicely visible. 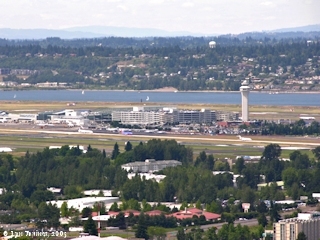 Click image to enlarge Portland International Airport as seen from Rocky Butte. 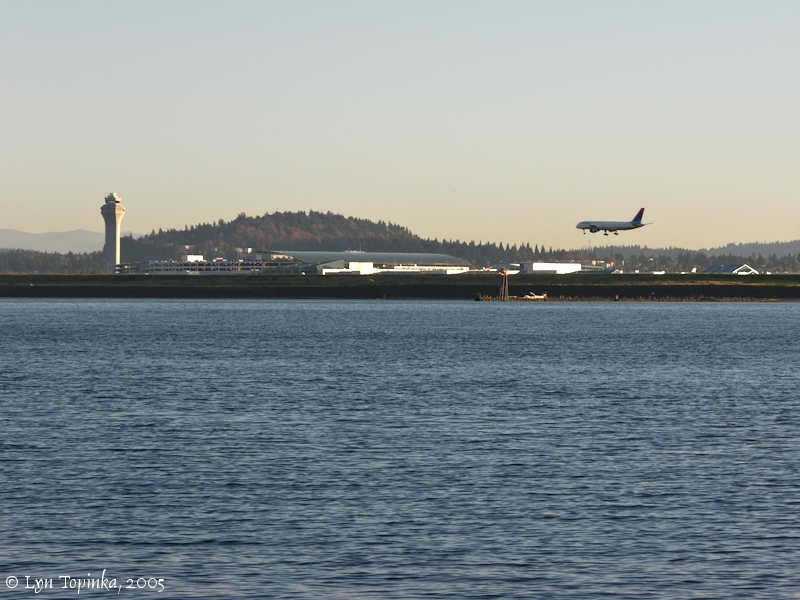 The Columbia River and Vancouver, Washington, are in the background. Image taken June 15, 2005. 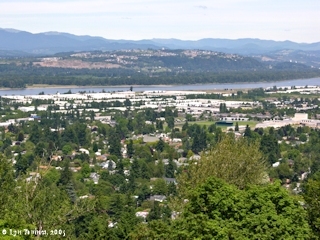 Click image to enlarge Government island and Columbia River looking upstream as seen from Rocky Butte. 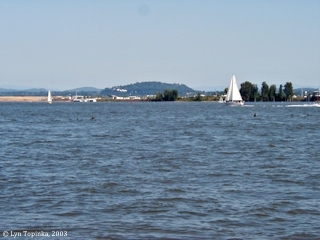 View of the Columbia River, with Government Island (left) and McGuire Island (right). Image taken June 15, 2005. Click image to enlarge Early morning, Portland, Oregon, from Rocky Butte. Image taken October 14, 2004. 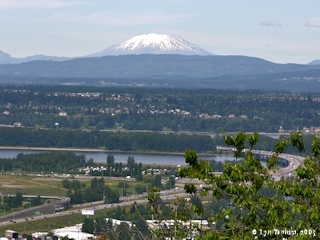 Click image to enlarge Mount St. Helens, Washington, as seen from Rocky Butte, Oregon. The Columbia River and the Interstate 205 Bridge are in the foreground. Image taken June 15, 2005. 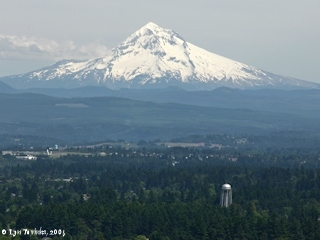 Click image to enlarge Mount Hood as seen from Rocky Butte, Oregon. Image taken June 15, 2005. Click image to enlarge Mount Jefferson as seen from Rocky Butte, Oregon. Image taken June 15, 2005.